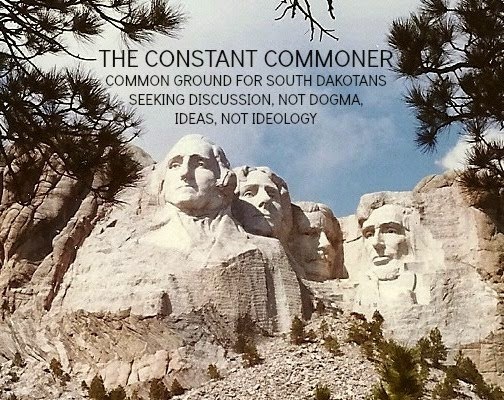 THE CONSTANT COMMONER: South Dakota Has A Low Tax Burden, But We're Spinning Our Wheels Economically. What's That About Low Taxes Stimulating Economic Growth? haven't been watching South Dakota. Just in time for "tax day," the excellent researchers at WalletHub today came up with a table that ranks states in order of lowest tax burdens. As usual, South Dakota turns out to be one of the lowest, this year ranking as the state with the 42nd lowest tax burden. WalletHub creates an amalgam of property, sales, personal income and excise taxes for its comparisons, and followers of these data know that South Dakota typically ranks among the lowest 10 states in the country on this annual list. By itself this is pretty decent news, but in context, maybe not so much. Our low tax status has been a perennially applied asset in South Dakota's economic marketing campaigns. This year The Tax Foundation even lists South Dakota as #3 in its annual "Best Business Tax Climate" index, a fact that's promoted aggressively by our Governor's Office Of Economic Development. GOED stresses our "stable tax climate" that "puts business first." There's no doubt that South Dakota and its low overall tax burden are relentlessly pushed and widely known. But has there been much of a payoff in terms of stimulating economic growth? Not really. In 2017 (latest full year numbers I could find), South Dakota's economy grew by less than a percent (.3% to be exact). This compares to a national growth rate of 2.1%. It also placed us dead last among the states that border us, with (contra-intuitively if you're in the low tax/high growth school of thought) Minnesota, Iowa and Nebraska, which beat us out even though they rank among the top 15 states in overall tax burdens. You could say that much of this is a matter of the recent slump in our state's agricultural economy, but using a longer and broader scale that takes into account the swings in the farm and ranch sector, South Dakota's per capita growth rate from 2011 to 2016 was up less than 1% (.22%) compared to a national rate of 6.27%. Both short and long term results contradict the notion that our low tax burden has done much, if anything, to generate even a competitive growth rate, much less a robust one. South Dakota's fixation on low taxes as a drawing card for new business and subsequent gains in economic growth has been a dud. If low taxes alone were enough to draw investment into the state, businesses would be leaving high tax states by the droves in order to relocate to South Dakota. That hasn't happened and it won't, mainly because tax burdens aren't the only thing that matters. I wonder if those responsible for relocating operations to SD consider the problem of relocating staff into an environment in which the state legislature is seemingly ill disposed to welcome any residents who diverge from the dominant norm. If so, and why would they not, for talent knows no color, sexual orientation or religion, then it’s likely SD does not make the cut. Sure, our tax burden is low; but we don't get much for them.